Irrigation, agriculture and welfare schemes continue to get a lion’s share in the Telangana’s Vote-on-Account Budget for 2019-20 with a total size of ₹1,82,017 crore. Presenting the Budget today, Chief Minister K Chandrashekar Rao has allocated ₹22,500 crore for the irrigation sector for the completion of various projects and ₹20,106 crore for the agri sector. The Chief Minister announced a waiver of farm loans, piled up till December 11, 2018 (the day election results are announced) up to ₹1 lakh. He allocated ₹6,000 crore for the first tranche this financial year. As promised in the election campaign, the Chief Minister has hiked the Rythu Bandhu grant to ₹10,000 each (from ₹8,000) to farmers on every acre they own. This will be in two tranches of ₹5,000 each ahead of the Kharif and Rabi seasons. He allocated ₹12,000 crore for the scheme in the Budget. Other prominent allocations: Aasara pensions (₹12,067 crore); KalyanLaksmi and Shaadi Mubarak (₹1,450 crore); Unemployment allowance at ₹3,016 per beneficiery (₹1,810 crore); Scheduled Castes development (₹16,581 crore); Scheduled Tribes development (₹9,827 crore); and Rythu Bima (₹650 crore). The Chief Minister presented the sixth Budget (after the formation of the State) as he kept the portfolio with him, while expanding the Cabinet early this week. Former Finance Minister Eatala Rajender has now been given Medical and Health Department. He presented the Budget in the Legislative Council. “We chose to present a Vote-on-Account Budget for 2019-20 as the Centre also came out with Vote-on-Account Budget. We will present a full-fledged one after studying Central priorities, getting clarity on likely Central fund flows,” he said. The Chief Minister said the State’s economy was in a poor state at the time of the formation in 2014. “It was crisis-ridden. There was acute power shortage and unscheduled power cuts, forcing the industries to work in shifts, resulting in the decline of the industrial sector. The farming sector was in distress resulting in a very high incidence of farmer suicides, and the economy was growing at a very slow pace,” he said. With a stressed rural economy, stalled irrigation projects, tanks in a state of disrepair and beset with successive droughts, the State was confronted with a daunting task, he said. During 2012-13 and 2013-14, the region’s growth in Gross State Domestic Product (GSDP) was 4.2 per cent, far below the national average of 5.9 per cent. “After the formation of Telangana, the growth rate more than doubled to 10.6 per cent in 2018-19,” he said. Telangana’s per capita income is at ₹2,06,107 for the year 2018-19, as against ₹1,81,102 in 2017-18, showing a growth of 13.8 per cent (as against the national growth rate of 8.6 per cent). He said the State’s own revenues (SOTR) for 2019-20 (budget estimates) are at ₹94,776 crore as against the revised estimates of ₹72,777 crore (for 2018-19). The average SOTR growth rate in the first four years after formation is 17.71 per cent. Transfers from the Centre (estimates) in 2019-20 would be at ₹22,835 crore, while in (revised estimates) 2018-19, these are at ₹28,042 crore. The estimated total expenditure in 2019-20 is ₹1,82,017 crore. Of this, revenue expenditure is ₹1,31,629 crore and capital expenditure is ₹32,815 crore. In 2019-20, the estimated revenue surplus is ₹6,564 crore and fiscal deficit is ₹27,749 crore. The fiscal deficit is 2.81 per cent of GSDP. The primary sector is expected to register a growth rate of 10.9 per cent in 2018-19. “This is possible due to improvement in power situation and rejuvenation of irrigation facilities,” he said. Boosted by improved power supply and a liberalised industrial policy (TS-iPASS), the secondary sector is likely to register a growth rate of 14.9 per cent in 2018-19. During 2005-14, AP’s total capital expenditure on 23 districts, was ₹1,29,683 crore. The capital expenditure on Telangana region was only ₹54,052 crore during the period. But during 2014 to 2019, the capex in Telangana stands at ₹1,68,913 crore. Soon after the Budget session began at 11.30 am, the House passed a resolution condemning the killing of 40 CRPF personnel at Pulwama in Kashmir recently. Moving the resolution, Chief Minister K Chandrashekar Rao announced a compensation of ₹25 lakh each to the kin of the slain CRPF men. Floor leaders of Congress, BJP and MIM also paid tributes to the deceased. After the Chief Minister presented the Budget, Speaker Pocharam Srinivas Reddy adjourned the House for Saturday. The Budget session will last till February 25. The money spent by political parties for the Telangana Assembly elections can be palpated in the alcoholic breaths of several flag-bearing men at the political rallies in and around Hyderabad. The money offered at the rallies — around Rs 300 per rally — is over Rs 100 more than Telangana’s rate under the Mahatma Gandhi National Rural Employment Guarantee Scheme (MNREGS) and close to the daily wage in many parts of the state. For the labouring poor, who are generally employed temporarily and often work under MNREGS, the elections are just another job, a source of income, except that most of the money spent is unaccounted for. The State Election Commission of Telangana seized over Rs 112 crore — Rs 90 crore in cash — till this week. The figure touched Rs 104 crore after income tax officials found Rs 51 lakh in cash at the farmhouse of S Shridhar Reddy, brother-in-law of Narender Reddy, a candidate of the Telangana Rashtra Samithi (TRS) contesting from the Kodangal constituency. A notebook the I-T department found in the farmhouse reveals the magnitude and methods in which money is being spent on the elections in Telangana. “Pages 1, 2 and 3 (of a diary) have notes from 27 November when a search took place. The total of all the entries comes to around Rs 1.2 crore,” I-T sleuths told the Telangana Chief Electoral Officer in a letter. The notebook also reveals that money was being spent on political campaigns, or “to get political favours by distributing money to various leaders”. I-T sleuths also found that several pages of the notebook were regularly torn in an attempt to cover their tracks. A loose page found in the farmhouse contained details of wine distributed across 26 gram panchayats. Furthermore, scores of enthusiastic men cheering at political rallies in Hyderabad are often inebriated. I can vouch for this from the two political events I attended in Hyderabad on 2 and 3 December — a mega TRS rally held at Parade Grounds that Telangana chief minister K Chandrashekhar Rao attended and a roadshow by the “Prajakutami”, the alliance of the Congress, Telugu Desam Party (TDP), Telangana Jana Samithi (TJS) and Communist Party of India (CPI), attended by Andhra Pradesh chief minister Chandrababu Naidu. “Look at them!” a traffic police signaled to me as I took photos of school vans that were being used for the TRS election rally. “Not the vans, the people inside them.” I could see a few young men lying inside a school van. The traffic police said that they were too drunk to get out of their vehicles. Alcohol is a theme that perhaps unites people at many election rallies across Telangana. “We were given flags and brought here. Most men have gone to work, which is why there are several women here,” a drunk labourer said, holding onto me for support. A few attendees at the rally said they would be paid around Rs 300 after the event. 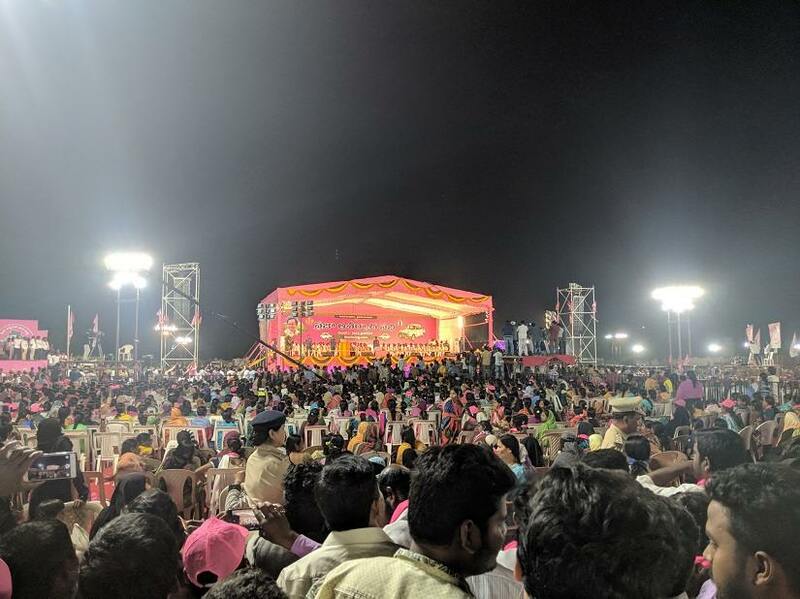 While the drunks at KCR’s rally enjoyed themselves dancing to the TRS’ songs and munching on snacks, those at Naidu’s rally were either waiting to leave or cheering the Andhra chief minister merely to pass the time. “Mujhe Telugu nahi aata (I don’t know Telugu),” said a young man who kept cheering for Naidu as he made jabs at KCR. After Naidu left, groups of women waited for vehicles arranged for them. While the TDP, BJP and Congress are seen as outsiders in Telangana, KCR is seen as one of them. TRS has even successfully appropriated various Andhra songs to his party’s advantage. At the rally, the audience danced to an altered version of a popular Telugu song from the movie Rangasthalam, which unfolds in the context of coastal Andhra of the 1980s. The lyrics of the TRS version of “Aa Gattu Kosthava Ranganna Eegattu Kostava” (will you stay on that side of the bank, oh Ranganna, will you come to this side) asks the electorate for whom they will vote — the good represented by KCR and his policies and the evil represented by the Prajakutami and BJP. Furthermore, the Congress is likely to have an advantage in districts such as Nalgonda, where it had traditionally held power. The votes of landless labourers and tenant farmers could add to the Prajakutami vote share in many areas since these sections have not been able to avail any benefits of KCR’s “Rythu Bandhu” farmers’ investment support scheme. 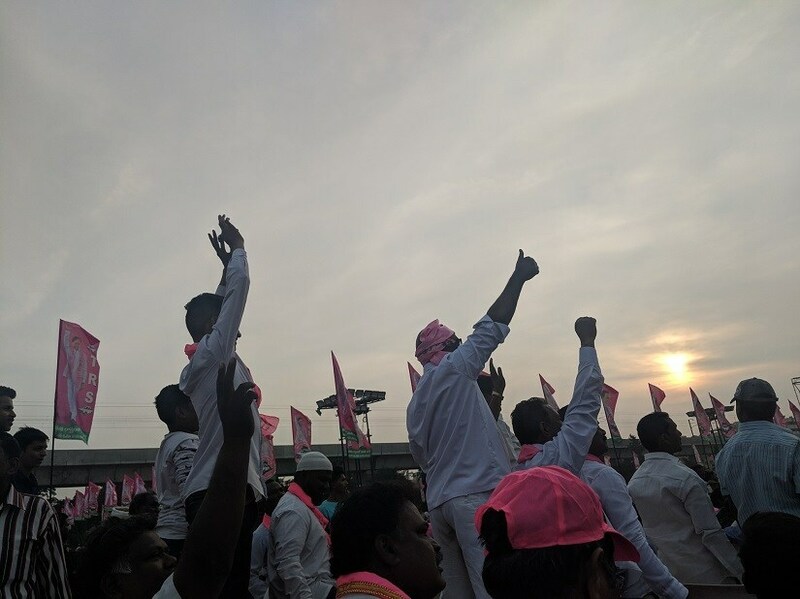 In areas where the contest is close between the TRS and Prajakutami, the pink party might get an upper hand because of the welfare schemes it has implemented. In constituencies where BJP candidates are contesting, the goodwill the TRS has harvested through welfare schemes might help them win. Also, the BJP seems to have an unspoken arrangement with the TRS in many places. “Take this,” a woman said, handing me a BJP pamphlet. “But vote for car (TRS).” She lives in Nalgonda town and gets paid around Rs 200 to distribute pamphlets. For these women, election campaigns are just another opportunity for employment. Although the unemployed help political campaigns, or attend rallies for money, they see a deeper meaning in the election process. They hold trust in the democratic process and will most likely leave for their respective constituencies on the day of the election or the day before. However, not everyone attending these rallies necessarily see the elections as a meaningful process. The teenagers who attended the TRS rally were, perhaps, the most disinterested. One of them even had his headphones on. Many of them recently graduated from school. The two I spoke to weren’t interested to vote for any party even if they were given a chance. Telangana gyaan: Why is pink the colour of the TRS? How many shades of pink are there? You could do a Google image search and marvel at the little panels that pop up. Or, you could simply head to the Telangana Rashtra Samithi’s (TRS) Twitter page. Scarves, caps, vehicles and even a mic resembling a cone of strawberry ice cream — it’s all a little overwhelming. But why is the party of K Chandrashekhar Rao, the caretaker chief minister, smitten with the colour of flamingoes and romance? It represents peace and love. That’s what Vinod Kumar, a TRS MP, has been quoted as saying by the Press Trust of India. And this, he added, is why the TRS chose it in 2001, when Chandrashkhar Rao began the movement for a separate state (separate from Andhra Pradesh, that is). Chandrashekhar Rao, 64, often simply known as “KCR”, faces an assembly on Friday, December 5. The results of an India Today survey contain good news for the TRS: 48 per cent of respondents backed the current government, up from 44 per cent last month. Standing in Rao’s way is an alliance between the Congress and three other parties: The Telugu Desam Party, the Communist Party of India and the Telangana Jana Samithi. The BJP is also contesting the election, in all 119 seats. But one thing’s for sure: India’s political parties are quickly running out of colours. Think about it: Saffron? BJP. Red? CPI-M. Green? JD-S and AIMIM. Blue? BSP. Yellow? TDP. At this rate, we may soon have to look beyond the visible spectrum of light!